Mannix Point is located on the edge of the shoreline, at the edge of the world. The Chieftain’s classic, ‘The Long Black Veil’, where they collaborated with Mick Jagger among others on the 1995 album of the same name, came in for a faithful rendition at the open mike session in Mike Murt’s pub on the Sunday evening of the weekend Mountain Roots Music festival in Cahirciveen. As a pall of mist and drizzle hung over the town, its slopes, bay and neighbouring Valentia Island there could not have been a more fitting soundtrack to a bank holiday spent in south Kerry. They could have thrown in ‘The Foggy Dew’ with Sineád O’ Connor for good measure. For an encore we beseeched the elusive sun with a cry from ‘Oh Brother Where Art Thou’ with the lament, ‘I Am a Man of Constant Sorrow’, appropriately by The Soggy Bottom Boys. But not even our proximity to the meteorological service Valentia Weather Station in the next field could budge the sun. As glorious blue sky photos of barbecues being stoked all over the country wafted across social media it would be easy to get bogged down in the saturated soft pitches of Mannix Point. Four days of this would test any relationship and a love affair with camping. A blazing turf fire in the heart in the camp sites spacious sitting/music room seemed to suggest they were hoping for the best but prepared for the worst and there was certainly little sign of summer in the squelching ground or grey skyline. But all great places are defined by the warmth of their welcome and their people, not the weather. Mannix Point is the brainchild and baby of a broadly smiling man, simply known as Mortimer. His relaxed and helpful manner permeates the whole place. At Mannix Point it’s more like pulling up at your favourite uncle’s place where you spent your happy childhood summers. Even when it comes to payment Mortimer makes no fuss if you haven’t got the cash handy (they don’t accept cards) – ‘You can drop it to me over the weekend, relax, everything is relaxed around here’, says he – as he gives you the grand tour of the facilities. They are comfy, cosy, clean, complete and convenient. (See the photos as they say it all). Mannix Point is such a snug spot, even if the going is still a bit soft underfoot. It is perched on the water’s edge, at the edge of the world, overlooking the bay to Valentia Island, and a short stroll into town. It’s a place you make your own fun and is ideal for water sports enthusiasts. (See previous post). It is a campsite renowned for its love of music and its late night sessions are the stuff of legend. However, as we sauntered back to base on the Saturday towards midnight, there was a group out in the veranda knock, knock ‘Knocking on Heaven’s Door’, but there is no way they were getting in, they were murdering it. There is more to Cahirciveen itself than meets the eye. 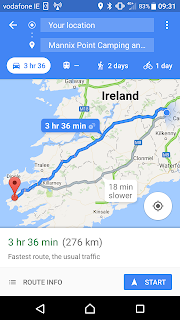 Its long Main Street, reaching out to the rest of Ireland in one direction and all the way to America in the other, has certainly had its ups and downs. Family names over disused shopfronts hark back to a time when they boasted tailors and timber merchants, but there are signs here too of determination and discernment if you bother to look for them. There are plans also for a new greenway stretching along the old railway line up the coast to the scenic harbour of Kells, which would surely be a super amenity and attraction. We happened upon on Mountain Roots Music, marking its fifth year thanks to a handful of dedicated enthusiasts and it was a life saver. Great tunes in friendly, family run pubs by outfits such as Jimmy Bozeman & the Lazy Pigs, their songs rivalled only by the harmony of broad Kerry accents and mischievous humour. The town’s tourist office based in an imposing former barracks multi-tasks as a local history museum and a Daniel O’ Connell Visitor Centre right beside a well maintained Town Park. As camping isn’t the same without the home cooking, Quinlan’s fishmonger (estd. 1963) in the middle of the Main Street is the finest and for the best bread and pastry treats an authentic French patisserie, Petit Delice, is just across the road. There is the multi award winning QC’s seafood restaurant, bar and townhouse; Eva’s Restaurant Bar & Beer Garden; and a gourmet pizza wine bar, The Oratory which has taken up residence in the stunning setting of a former church, to mention just a few of the stand out options in the town – there are many more including some quirky craft and gift shops. Let me put it this way. If Ireland had a Basque country, it would be Kerry – you know what I mean, having their own language and all. Well then, Kenmare would be our San Sebastian with its culinary delights; Dingle our Biarritz and Cahirciveen, Bilbao with its rugged authenticity and earthiness; Valentia Island its Guggenheim, a natural work of art on permanent display and who knows what other gems you will find if you bother to tog out and take on the grey days. Mannix Point was established in 1984 and not surprisingly has numerous awards to its name. 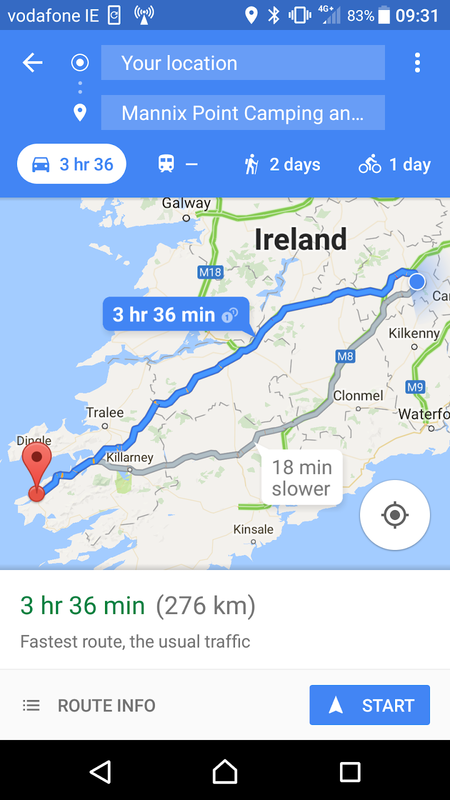 It was €30 a night for our campervan with two adults (incl. electricity) and its €1 for the shower tokens. One small suggestion is that a few lights on the long dark entrance into the site wouldn’t go astray and surely could be easily solved by a solar or sensor system in this day and age. PS, No one seems to agree on how to spell Cahirciveen, Caherciveen, Cahersiveen…but it always sounds like music to my ears.